A look at what it might take to catch the current Gridiron NSW Champions. Prior to the start of the season I tasked myself with a difficult assignment: taking an in-depth look into the big questions facing each Gridiron NSW team in 2009. As last week was Round Six of twelve, I thought it would be as good a point as any to reflect on my comments. Yet the truth is an even bigger question has arisen in the time since: Will there be any point in Gridiron NSW hosting the Waratah Bowl in 2009? I say this because of the obvious issue facing every Coach out there; the dominance of Sydney Uni. I’m not one for a defeatist attitude. I’ve seen Davids rise to beat Goliaths. Or, to use a recent example, the Giants rise to beat the Patriots. Yet there is a huge difference between a league like the NFL, where each team is constricted by a financial cap that aims at equality, and a league like ours where most players stay with one club until the very end. To be honest our League is more equivalent to the US Major League of Baseball where the rich get richer and the poorer sides struggle for hometown recognition. Or the English Premier League, where a large percentage of the sides would claim glory at finishing fifth. Yes, things will eventually have to change. Fady Aoun will one day live up to his word and retire (only to hear Centres from around the League breathe a sigh of relief). And there will come a time when the Lions will actually look to their bench and make starters out of them. Yet in 2009 that seems like a mirage in the distance. Sure, the ladder to the top shouldn’t be that easy to scale. Yet it should be that slippery to hold on to. For those at the Preds, aiming for the Lions isn’t a game-to-game ambition, but more a season-to-season one. Thus, every time we face up to the ol’ Blue ‘n Gold there are no expectations and no reason to feel stressed or pressured to perform. Heck, we’re so relaxed with the concept that we’ve challenged the side to preseason scrimmages in four of our five seasons in the League. The real pressure comes when you look at sides like the Pirates. Many around the League refer to the West Sydney side as the Eternal Bridesmaids. With multiple Wolfpack representatives decorating their outfit it’s easy to see them as a contender to the crown. But the Pirates have struggled all season long, with an inability to strike when the iron is hot. Their long-time QB Dave Ward, usually the scourge of many a D-Back, is looking more and more human as the years pile on. And though the Pirates are the side that last handed the Lions a loss, they in no way resemble that same team now. Gone is the fast & lethal UTS D that almost stole the Lions crown in 2007. Also gone is the UTS unit that looked destined to step up to the plate in 2006 & 2007. Their fast and lethal Defence looks nothing like it did in the 2007 Grand Final when they had the Lions on the rope. Since crumbling in that game, the Gators have never really recovered. Even their Offense, that could put points up in blistering style has dried up. Surely the side will rebound given the great talent that their Colts program is producing, but by then the old heads will be past their prime and new holes may have arisen. I should also point out that my comments aren’t made to insult these teams or their coaches. In fact, I believe my words to be closer to a eulogy. For with the lack of competition in NSW, our League can only deteriorate. After all, who’ll push the Lions to hold the top spot if they can do so without recruiting, or bringing in more than a dozen new plays? Before Wollongong folded there was talk to split the League in two after Round Seven so that the top players, in the top sides, would benefit from playing against each other. If the runners-up are closer to the wooden-spooners than the Champions, what occurs then? And what are the ramifications for our long dominant Wolfpack? This is in no way an indictment on the League heads, or the coaches across the state. No coach out there is trying to avoid the Lions, or not preparing for the match-ups. In the same light, the Lions have just as tough a draw as anyone else. Gone are the days when struggling sides would simply forfeit the match, hoping to save their players for a more meaningful clash. Point in fact, the Preds have played them twice already, losing by an accumulated 109-0. Embarrassing? Sure. But we played both matches. And other sides in this League haven’t faired much better. A multidimensional Penrith City side that has numerous Wolfpack members also failed to put up a point in their clash with the reigning Champs. They’re just that good. So with the coaches and the League inspiring us and pushing us to challenge the Lions, where does the slack come from? In my opinion, it’s us, the players. Spend time with any of the boys from the current Sydney Uni squad and you’ll begin to understand why. Some of us are committed to our sport. By committed I’m not referring to simply turning up to training, doing as the Coach asks and preparing for gameday. For that isn’t where the Champions rest. Instead they go further. They’re in the gym, preparing their bodies for the wear of the game, in and out of season. They prepare their minds through research: firstly on their own position and the technique for that spot; and then through studying tape of their opposition, finding ways to individually and as a team exploit the weaknesses in others. In spite of his talents, PC Outlaws RB Stuart Etcell can't outrun ALL the Lions. I realise that throughout the League there are a bunch of players that strive to achieve these same aims. You can see them any given Saturday of the season. Look at the way the Seahawks thrive due to Pete Upham’s diligence. Try, if you can, to find a better back in the State other than Stuart Etcell. Spend an hour watching the flawless footwork and throwing action of Ward. Across the League there are plenty of individuals that see what it takes to be a Champion. Yet they are the exception to the rule. With the Lions you’re seeing 15-20 individuals go through the same preparation and then come together to form a fearsome unit. For most of us other teams that number ranges between 5 and 10. The Pirates have come so close because they too have multiple individuals that prepare for greatness. Yet they still have only 10-12. Eventually they’re outnumbered and outmatched. Just look at last year’s Grand Final, where in a neck-to-neck point scoring race between them and the Lions, the Pirates petered when it counted. The simple case is this: the Lions have raised the bar, and to beat them, we first have to realise what that bar is. We need to build Clubs that have the same sort of attitude. Where winning is what we’re meant to do, not something we strive to do. Where beating the Lions isn’t viewed as an insurmountable task, nor is a loss to them measured by the score. Where the fight for the Championship is a League-wide race not a forgone conclusion half way through the season. When you look at the effort you put in to play this sport, is it worthy of the Champions? Note: Thanks to the Sydney Uni Website for the photos used in this story. Sometimes a little home-cooking is all you need to get a win in the Gridiron NSW league. In front of a strong crowd at Pennant Hills Park, the North Western Predators won their first game of the 2009 Gridiron NSW season, knocking off the Sutherland Seahawks 28-22. A see-sawing game, the clash went down to the wire, with the Preds holding off the potent Seahawks offence in the final minutes of the game. Linebacker Francisco Diaz forces the Sutherland QB to throw away the ball. Indeed the Predators Defence played amazing, constantly putting pressure on the Seahawks Quarterback. Linebacker Francisco Diaz had another great game, making two crucial sacks that killed possible Seahawk touchdowns. His running partner David Quigley had two interceptions, returning one for a score. And Nose Tackle, Houssayn Bazzi picked off a shovel pass to end another Seahawks drive. QB Mitch Hunt threw a first quarter TD before leaving the game injured. The Offense had to deal with the loss of starting Quarterback Mitch Hunt. Running to the outside, Hunt was hit on a controversial call and slid into the boundary fence. In his place, rookie Quarterback Josh Davis played above his years, leading two Predator scoring drives, including throwing the first touchdown of his career. The Preds congratulate each other after their first win of the season. There will be a lot of work to do to get ready for next week’s game. The Preds will be facing 2008 Runners-Up, the West Sydney Pirates. After falling behind 14-0, the North Western Predators almost stole the show, dropping Saturday night’s Gridiron NSW`clash against the Bondi Raiders 16-13. The match up saw one of the League’s oldest sides, the Raiders, take on the youngest. And the experience showed as Bondi came out swinging in the first half. The Preds, who have faced some of Gridiron NSW’s top sides across the first four weeks, were finally playing against a side on their level. Both teams have been struggling early, and the Men from North Western had hoped to turn their form around against the Raiders. Indeed the Preds crossed the line two more times than the Raiders, yet had one touchdown disqualified for an infringement penalty and another overruled by the side official. The second effort was with two seconds left in the first half and time expired before the Preds could get another play together. There were great signs of hope though for the Predators. Their Defence took it up another notch, with Linebacker Francisco Diaz causing mayhem in the Bondi backfield. Additionally the Offense moved the ball with relative ease, being stopped more by themselves than the Raiders. Coach Hill believes it all comes down to training. With their first home game of the season next Saturday, the Predators will surely be fired up to entertain their local fans. No doubt about it, being a coach in Gridiron NSW, whether be it Head Coach or as an assistant, is not a fun job. Most of the time your giving up valuable free hours to preach a system to people that may not even be cut out to play the sport. You race out of work and head down to a cold, wet training field just to find that the unit you think needs the most work hasn’t even shown up for that night’s session. And, when they get whipped by another Gridiron NSW side on Saturday, they look at you vehemently wondering how you could let them down. Sure, maybe Coach Dunne doesn’t have this problem. Then again, that’s never usually the way with a winning program. From our bush league to the big league, people want to play for winners. Truth is, asking a decent side to strive for greatness is easy. You point at the within-reach trophy and say, “Let’s get that.” The real trick comes when you have a Club that’s continually struggling. How do you explain to them that they should be striving for more? How do you keep them motivated through recurring losses and explain to them that a 2-8 season is all part of the long process? And how do you do all that without essentially driving them away? The truth is, asking people to be part of a building process is a hard sell. The fact that the Preds continue to exist should alone be measured as a great success. Our ability to continue recruiting a team filled with rookies year in and year out is amazing. But I’ll be the first to admit that it means very little. Wins. That’s what this is about. And while I may know the amount of time, effort and dedication it takes to have 30 players on the same page running a program with no margin of errors, our new recruits never do. So it falls on our coaches keep these new talents motivated throughout these growing pains. Our coaches are charged with the responsibility of inspiring these men. Not only for the upcoming game, but for the next season, and the one after that. The current Lions crop that’s running amok in this League didn’t happen over night, so who are we to expect similar results in a shorter period? Establishing a core unit is key for the Preds. Some of us don’t care about the interim period. We play for the team because we believe in the endgame, that is, expanding the sport in NSW through the stability and success of our new club. So it doesn’t matter what the Coach says, we’ll be back next week to fight on. Others though, are about instant gratification. And watching them take in the criticism, the attack on their efforts, especially after said drubbing is like watching a red cape being waved in front of a bull. Their pride is insulted, their reputation sullied and immediately the start to quit at one level or another. Whether it be to lose faith in a system or, the ultimate dissension, to consider changing teams. Our current Head Coach, Paul Hill, came to our team with a reputation for being as militant as his military background might suggest. The stories from Gridiron Victoria are that if you trained and played for Hilly you gave everything or you’d give nothing. One old war tale had Hilly running a second straight training session at 10pm, because the first one, at 7pm, was flat. Indeed, at his first training session with the Preds, the man ran a ‘Ready-Ready’ drill for near 15 minutes and the legacy has lived on to terrorise most of those first year Preds. Yet apart from that day, I can’t recall seeing that coach again. Sure, there are flashes of that fury during our lowest moments. Yet, most of the time, Coach Hill keeps his ‘Drill Sergeant’ persona well hidden. For a time it seemed bizarre. I’ve seen members of the Preds Captain Committee ask Hilly to bring out the Drill Sergeant routine, to demand more from his players. Yet the Head Coach has refused, instead opting for a more nurturing approach, coddling the inconsistent and continuing to welcome those who come to only wear the jersey. Some might suggest that age has caught up to the longtime coach and that his approach has softened as a result. However those ‘suggesters’ would be neglecting the most fundamental truth: Coach Hill gets a level of dedication from his players that can’t be denied. In the end, with a Club like ours, always one step away from extinction, that dedication is currently far more precious than trophies. Players who are committed to the cause, no matter how long it takes, are the foundation for any future plans. And dedicating yourself to the Club’s Head Coach, or to the Club itself, is only splitting hairs. As long as you’re coming through the same door to play for the same cause, you’re a valuable team member. With Coach Hill moving into the Head Coach role this season, it’ll be interesting to see how many of these players who he’s dedicated so much of his time to, show the same dedication in return and come back in 2010. For with the Preds, retaining players has long been our primary concern. At the time of our best season, we had near twenty returning players. That number has fallen since. Yet with new tutelage and new leadership the aspect of change is enough to give us hope. As with all things, though, only time will tell. The North Western Predators’ rookie Defence took a huge step forward on Saturday, beginning to find their form against old Gridiron NSW rivals, the Penrith City Outlaws. In spite of the 33-6 scoreline, Head Coach Paul Hill was upbeat about the way his boys performed against one of the oldest teams in Gridiron NSW. 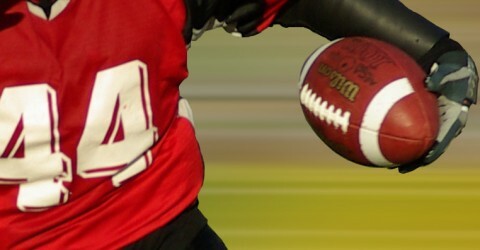 In fact, the Offence could take the blame for three of the five touchdowns scored by the Outlaws. Three times they gave up the ball right next to their own line, allowing Penrith City to quickly build a 20-0 lead. Linebacker David Quigley wraps up the Outlaws Running Back. It also didn’t help that the Preds’ pass-happy Offence struggled with the strong winds whipping across the field in Kyeemagh. After beginning to find form last week, the scoring attack couldn’t regain the same momentum and were only able to cross the line once in the game. Coach Hill believes a lot of it can be blamed on inexperience. However, after holding the potent Outlaws Offence to only a single touchdown in the second half, the Predators once again can walk away from a game looking to the positives. Next week will be a League bye week, and then the Preds will play the reigning champs, and undefeated, Sydney University Lions. The two teams have already faced twice this season; in preseason scrimmage and in game one, with the Lions winning that match 54-0. Yet Hill thinks this game will be different. The new-look North Western Predators Offence started to click in last Saturday’s Gridiron NSW match against the UTS Gators. In spite of missing six starters, the Predators regrouped in the second half to challenge the high-scoring Gators, before losing pace, and the game, 42-15. It took a half a game before the positives started to show. The Preds headed into the major break down 21-0, failing to move the ball on Offence with any continuity. Sure enough the Preds got on the scoreboard early in the second, yet not with their Offence. With UTS pinned deep in their own territory, Defensive End Phil Calloway tackled the ball carrier in the end zone to score a Safety; the first two Predator points of the new season. With the momentum swinging their way, the Offence then came out and found their rhythm, with McEnaney soon catching the Preds first touchdown of the new year. That pulled the score to 21-9 and the Predators sideline began to rise. Yet, as the game progressed, the strong Gators Offence took over and picked on the young North Western defensive backs. Wide receiver James McEnaney outran many a defender in Saturday's match. Nevertheless, unlike after Game One, the team’s camp seemed far more optimistic after this loss. Due to a lack of pure Officials, Gridiron NSW has long been forced to use player refs and other volunteers for sideline duties. It’s obviously not surprising with a niche sport like Gridiron in Australia. Even more mainstream sports, like basketball, adopt similar approaches for their local competitions. However, where a basketball game will need – at most – four players to help out over a 50 minute period, our League can require up to eight players to spend an extra three hours at the field. It gets even more demanding when you ask those players to sit a weekend refs course to qualify just to do duty. The result is usually the same for most teams: you end up with a handful of dedicated players helping out, while the majority checks out. This season the League has made it even tougher, insisting that the Bye week team supplies refs for one game and cover the Match Official duty for the rest. That requires the team with the week off to have a player at each and every game to watch the procedures and handle basic League admin. Not many guys would put their hands up to spend their Saturday doing such a job. Not even the lovers of the game. Last Saturday five of the more committed contingent of Predators were forced to handle the entire duty for the team. Those five men were at the field from just after noon ’til around 10:30 at night. Additionally, the games were held in Penrith, between 30 to 90 minutes away from their homes. One of them left his house in Manly at 10:30am and finally got back at midnight. Understandably they were all very upset. I’d love to present a counter-argument to his case, but there isn’t one. He’s fully has the right to refuse to do duty. As are all the not-so-helpful guys that left him hanging there. Yet if everyone took that approach, where would the League be? To have a League at all we need everyone to lend a hand and help out. What we don’t need is to ask a select few to lend more than a hand. Last year, the Preds tried a different approach. We charged every player a $50 Duty fee at the start of the season. That covered chain duty, field marking, reffing games and match official duty. Whilst it sounded steep, the Preds offered to pay the players $25 for every duty they fulfilled. Thus, do two duties and you got your cash back. In the end four players made around $100… Profit! They fulfilled six jobs throughout the season. As someone that earned $100 I can’t say that I enjoyed it. Yet at least it rewarded me for my efforts. And it was nice knowing that I was taking the money off some slack player. Still I’d have been happy only getting my $50 back. Another suggested solution to the ever-lasting problem has been to roster the responsibilities. This would ensure an even workload for all involved. And, when someone tries to wiggle out of their job, a $50 fine would be enforced should that person fail to find his own replacement. Again, it’s a little steep and not really the healthiest way to motivate someone. In fact, it reminds me of jury duty… both the type at the local courthouse, and Pauley Shore movie (blech)! Yet like jury duty, League duty ensures our rules and regulations continue. So what is the answer? Okay, there’s no legal obligation, but there sure is a moral one. For every time you pull that jersey on, no matter which Club it’s for, you should essentially turn to all those volunteers, from your team and the others, and say thank you. It’s those guys that ensure you get a game. And it’s those guys that ensure your Club continues. That’s not a romantic gesture; the League has the right to ban a team for failing to fulfil their obligations. So if you’re part of the 90% of Gridiron NSW that goes out of their way to avoid picking up a ‘lolly-pop’, has the never-ending something to do when a refs course is on, or ducks behind someone else when there’s a spare black ‘n white, you owe the other 10% a big thank you. They make it all possible.